Employee turnover is considered by many business leaders to be a simple matter of keeping the numbers down. The danger is in thinking about employee turnover like profit margins. High profits are good; low profits are bad. As long as your employee turnover rate is lower than your competitor’s employee turnover rate, then you have nothing to worry about, right? Not always. Employee turnover is not a black and white situation. The biggest mistake you can make regarding employee turnover is to think about employees leaving in the same way that you think about money. Twenty dollars is the basically the same whether it’s coming or going. People aren’t as simple as that. People range widely in what they bring to your organization. A person can be a superstar, a burden, or anything in-between. “Dysfunctional turnover” is when your best people are leaving, instead of your worst performers. The opposite of that situation–your worst performing employees are leaving, and you’re retaining your superstars–is referred to as “functional turnover.” In both cases, the actual rate of turnover is important to note, but it isn’t as critical as whether it’s functional or dysfunctional. Two companies netting $27.6 million per year are experiencing 20% turnover, but company A is having dysfunctional turnover and company B is having functional turnover. 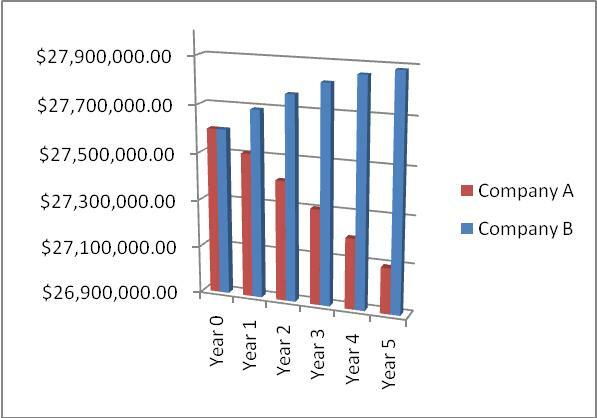 Over the course of 5 years, the profitability of both companies can vary by almost a million dollars per year. This example only addresses the hard numbers, not the impact on the organizational climate of having more low performers around for a long period of time. The impact on organizational climate can be even more serious than the simple ebb and flow of your bottom line. If you’d like to see some additional information on turnover as well as some more examples of how it can be improved, feel free to download and read my one-sheet about turnover. If you’ve got any questions or inquiries about how functional and dysfunctional turnover could affect your business, please feel free to contact me.